Since 2010 the University of Tasmania, Architecture & Design has fabricated structures using a custom sheetbased digital fabrication construction system. 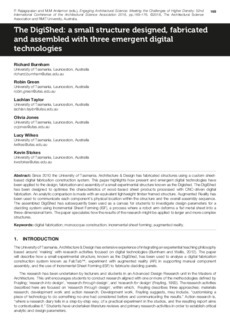 This paper highlights how present and emergent digital technologies have been applied to the design, fabrication and assembly of a small experimental structure known as the Digished. The DigiShed has been designed to optimise the characteristics of wood-based sheet products processed with CNC-driven digital fabrication. An analytic comparison is made with an equivalent lightweight timber framed structure. Augmented Reality has been used to communicate each component’s physical location within the structure and the overall assembly sequence. The assembled DigiShed has subsequently been used as a canvas for students to investigate design parameters for a cladding system using Incremental Sheet Forming (ISF), a process where a robot arm deforms a flat metal sheet into a three-dimensional form. The paper speculates how the results of the research might be applied to larger and more complex structures.